My Spanish is not perfect. And when I say it’s not perfect, I mean I make occasional, and possibly egregious errors. I actually can’t think of any at the moment, but if you introduce me to one of your more careful Spanish-speaking friends, I promise to offend. I also have a bit of a speech defect in Spanish, characterized by my lack of ability to properly say a single r in close proximity to a d, especially when separated by vowels. That is to say, the following words are my nemeses: Rodrigo (sorry to all the Ro-ros out there, but your name? It gives me hives), adolorida (in pain (for a woman)), arado (plowing), and my personal word nightmare: refrigerador. I was recently told by a Chilean that everyone has problems with the word refrigerador and that it’s a French word and we should blame the French. Consider yourselves blamed, Frenchmen, and if you’re named whatever the French version of Rodrigo is, consider yourselves doubly blamed. So, my Spanish? It’s not perfect. And I have a tremendous amount of sympathy for learners of English, having been an English teacher for several years both in the states and in Chile. There are certain typical mistakes you can see among native Spanish speakers when learning English, and what I love so much about this particular piece of vandalism is that it typifies three of them. One, overuse of the article. In English we do not use the article the for general terms, like love, life or in this case, punk. In Spanish, “El amor es ciego” (lit: the love is blind), La vida es difícil (lit: the life is hard), etc. Here we have someone wanting to express something about punk, and they find themself in the posession of an extra article. Ten points off. Next we have the lack of word-terminal s, which in this case leaves the poor sentence completely verbless. What should read punk’s for punk is, now reads punk, and only punk. Oh copula, how we miss you! Another deduction. And third, we have a situation often seen, when not clear on how something should be spelled in English where a similar or same-sounding combination of letters is provided. Near where I live there are several coffe shops, and a bowling alley called Japimax, presumably for the great joy it brings you. And here we have madafaca. And I don’t even know where to start with this one. Should I grab a can of pintura en spray rojo (red spray paint) and make the corrections? Or should I silently absorb them, realized I understand the sentiment and that that’s good enough, and what I’d want from people listening to me when I make my linguistic faux pas (there go those French again!). It’s really not mine to argue whether the punk is or is not dead. I don’t even know who “the punk” is. Or maybe I should take one of the many new black conference teeshirts that have recently come into my posession, turn them inside out and write the same lema (slogan) across the chest? 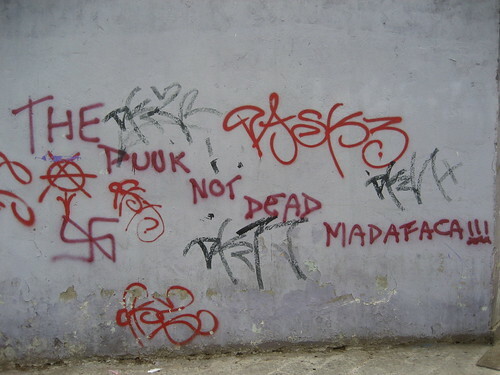 The punk not dead madafaca. I could win friends, influence people and misteach a whole new generation. So tempting. oh, I'll talk about anything! In this case I was talking about having been to a biodynamic winery and how the chickens followed the horse that drags the plow because the broken earth yields all kinds of goodies for the chickens to nibble on without having to scratch so hard. And yes, there is a special word for what chickens do there, and it's escarbar, and I'm not sure if I should be proud or embarrased that I know that word! I guess I know more about farmyard animals than I thought! It brought back good memories of this exchange student that was my classmate for a year, during school. His name was Wilson (a.k.a. El Gringo). We were very good friends back in those days. I remember how hard it was for him to say the words you mention and others, like "vereda", "paradero", or our names. And there was a Rodrigo in our class too. He always took all of our cruel jokes and laughter with a big smile, but I know how frustrating it was for him not being able to pronounce all words. Your Spanish is excellent, top notch, pulento, Eileen! 🙂 Te he escuchado en dos ocasiones, y pronuncias muy bien las palabras. Sólo espero que mi inglés no haya sido demasiado desastroso (cualquier corrección es bienvenida). Ah… this brings to mind the t-shirt brought back from Taiwan by Susanna in the 80's… red white and blue blocks, and in the white block across the middle, in that weird iron-on rainbowy script "Celebate!!!!" an attempt, I think, at celebrate, but seeming to comment on another area of the wearer's life. Having learnt Spanish by furiously writing down words at night when I lived in Argentina, I thoroughly enjoyed this post. My first big mistake: not knowing that coger in South America does NOT mean 'to take' – at least not in the usual sense. So when I asked the bus driver in Corrientes, 'donde puedo coger el autobus?' and he responded 'donde QUIERES querida!' to the laughter of his friends, I quickly realize I had a long way to go before I fit in. @Andrés, Thanks for the compliment, and your English seems great from over here. Thanks also for increasing the list of words I must say wrong. I just heard myself say vereda, and I kind of sound like I'm saying the word for stripper (vedeto, for those of you who aren't so awake yet). I seem to do okay on paradero, but I think it's because of where the main word stress falls. I'll have to analyze. Also, you've heard me twice? Do we know each other? Maybe you're part of the "ends of the earth" crew? Do tell! @Michelle, I had never heard that particular pieceof Engrish. It's precious! The person who sold it was probably congratulating himself on such a wise purchase as the Celebate tees flew off his shelves. @Legal, I had no idea you read here. Nice to see you! Donde tú quieras… (with subjunctive) hmmmm. Not so nice. But at least you didn't say it in Chile and also use the word guagua, which here means baby. And yes, learning language after language (like you do) can be cruel. I have just learned the one foreign language and stayed put. Much easier! I didn't even realize that the last word scrawled in graffiti was supposed to be mother… until I got to the end of the post. hilarious! I've had several conversations with other teacher friends about all of this stuff and our fear of having students named Rodrigo and then embarrassing ourselves in front of the class. And I to properly pronounce refrigerador, I have to say it super slow. I just saw The Punk walking down the street the other day. He seemed healthy to me. Ahh Rodrigo is the bane of my existence too! There is a trick though. I'll teach you someday, it's hard to explain in writing. Funny story: I always have a Rodrigo in my class whose name I pronounce a la gringa. A few weeks ago one particular Rodrigo kept saying my name "A-B" and I when I went to correct him (No, it's Ahhh-bee)he said "Well, I'll start pronouncing your name right when you can pronounce my name." Ohhh burn! @Reneé, I've gone for refri for some time now. I think I remember in Spain it was called the nevera, or somesuch. It's torture, I tell you! And madafaca took me a minute, too. @Rafael, if you are who I think you are, thanks again for making me laugh. You pretty much never fail at that! Glad the punk not dead! @Abby, I can say it, but I have to take a deep breath and think about it. For a person who (thankfully) doesn't have that many words that are difficult to say, it seems like a giant hassle. I like your name A-B! And the world calles me Eigh-lyn, it's all kinds of wrong. I consider it my right to say Droddrigo, or rorigo si me da la gana. @Ely's mom, I also hadn't considered verde as a word that gives me trouble, but again, as I listen to it, it doesn't sound great. Lucky you that your eyes are calipsos, and not verdes here! (that plural gave me pause, wasn't sure what to do, actually!). Oh, and what about the word codornices? That's evil, too. Pérdices isn't much better, either. I think I'm calling a moratorium on birds this week. Ah! Excellent point. I refuse to date boys named Rodrigo for the potential embarrassment factor in the sack. All this talk about hard to pronounce words! You'll be sad to know, Eileen, that J has mastered your name, and you are no longer "Idreen" The garage is still the bagraj, though, and the chechins are still in my kitchen. The same guy also stopped me on the spot the first time I mangled "Rodrigo" and made me say "Ro…dree…go" over and over… worked like a charm… no one has complained since… dipthongs… now that's a whole different "bolgeim"! love the madafaca! very creative spelling. I have a hard time with the word "norteamericano/a" that r-t combo is what gets me. You will see me in all sorts of linguistic contortions to avoid that word. Great post, Eileen. I shouldn't laugh at the punk. I've never heard my horrendous accent with proper Spanish pronunciation ears. Lynn Truss, author of "Eats, Shoots, and Leaves: The Zero Tolerance Approach to Punctuation" once protested outside the London premiere of the movie "Two Weeks Notice." She stood there with an apostrophe on a stick and held it between the k and s of weeks. So I say you get a can of pintura en spray verde and make corrections. One of my internet-y pals said she saw these things you can put on your screen and then write on with dry erase markers. And then, she said she thought of me, only I would use them up faster than anyone. Except maybe you. I love madafaca, it makes me laugh to no end. And OSOM. Hahahaha. See? Funny. I have problems with certain words in English, of course: order, Carter, butter/better, that sort of thing.